Creating a truly unique timber floor is limited only by your imagination. 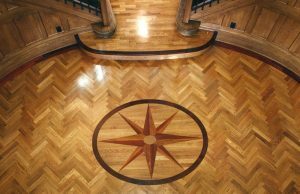 Mixing wood species and specialist inlays – (such as circles or stars), and parquet laid in patterns – (such as herringbone, chevron, or basketweave), can add a distinctive style to an interior. Our craftsmanship will add value for many years to come, in both traditional and contemporary settings. Patterns can also be laid into existing floors. Give us a detailed drawing of what you would like to achieve and we will create it for you. 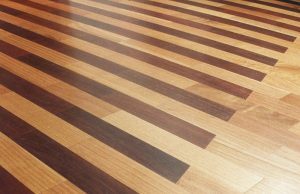 T & G stands for tongue and groove and refers to the type of joint used in flooring. Planks are long floorboards of differing lengths that are direct fixed to your subfloor. Herringbone is a flooring pattern where pieces of wood are cut to an equal size and installed in a zigzag pattern. The ends are square cut. Chevron is a flooring pattern where pieces of wood are cut to an equal size and installed in a zigzag pattern. 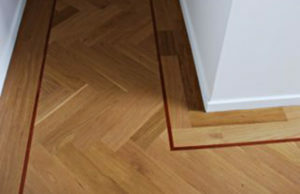 Chevron differs to herringbone in that the ends are cut on an angle creating a distinctly different pattern. Small pieces of wood are arranged in blocks – consisting of 3, 4 or 5 fingers – to create a ‘tile’. These are installed at right angles to each other. Basketweave is a complex flooring pattern alternating the grain of the wood and using both square and rectangular blocks. Using different colours of timber can emphasise the pattern.